If you’ve been reading this blog for a while now, you’re probably pretty much up to date with major threats and painless advice that can help you stay safe online (if you apply the advice, of course). Is cyber crime really that pervasive or is this just an attempt to manipulate me into thinking it is? The question is 100% justified, especially given how often the media reports on cyber attacks as well. To answer your question: yes, cyber crime really is that widespread. And it all has to do with automation. 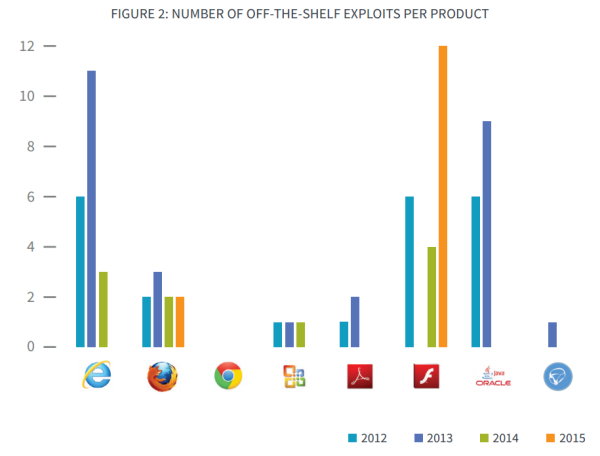 What do buyers look for in an exploit kit? How much does an exploit kit cost? Cyber crime used to be the occupation of a limited group of people who had deep technical skills and used their abilities and know-how for malicious purposes. But that was many, many years ago. Even though the Internet is only 20 years old, a lot has happened since it became widely available. For example, in the past few years, cyber crime has developed into a big business and the malicious hackers behind it are running their ops as such. Long story short: if you have some cash on your hands and some skill (no expertise required), you can try your hand at malware attacks. and how you can improve your protection (and avoid becoming a victim). Quick definition: exploit kits (EKs) are programs that find flaws, weaknesses or mistakes in software apps and use them to gain access into a system or a network. The most prevalent exploit kits have the ability to download malicious files and feed your system malicious code after infiltrating it. These exploit kits are used in the first stages of a malware attack and they play a very important role in the success rate of these attacks. 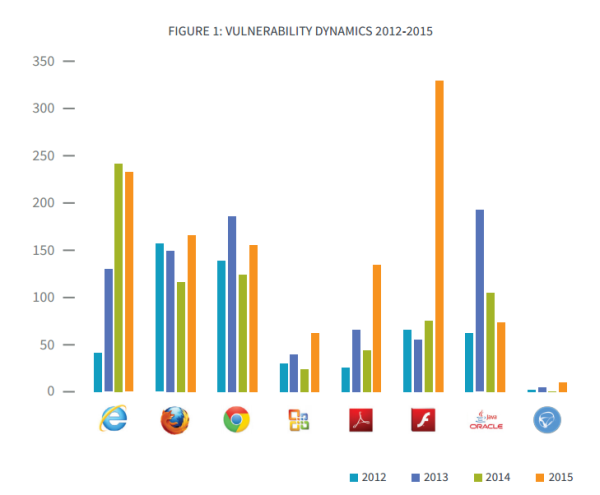 The better the exploit kits are, the faster and more aggressive the attacks are as well. The potential victim ends up on a web page infected with Angler exploit kit or surfs a legitimate website that has infected banners in it. Angler then scans the victim’s PC to find outdated software and the correlated security holes. Once a backdoor is opened in the victim’s PC, the dropper is downloaded onto to the system, which executes malware (in this case, ransomware). As a consequence, the victim’s data is encrypted, blocking access and demanding that a ransom be paid for unlocking the data. of the referrers were therefore active only for a short period and were removed after a handful of users were targeted. Why has this exploit kits-as-a-service model emerged? Critx might seem like just another exploit kit but it is being used in a unique way. Instead of being sold, the exploit kit is being rented or leased on its own criminal infrastructure. It is all set up with multiple IP addresses and redundancy to prevent takedowns. All a criminal would have to do is simply register a domain and point it to this infrastructure. They use Bitcoins for payments – staying anonymous is a critical part of the job in cyber crime, so the advent of Bitcoins offered the perfect, untraceable payment method to be used in exchanges in the dark web forums and between the attacker and the victim. The easiest hack toolkit made available in the crimeware market on record was seen sometime in 2006. Enlist the infected system into a botnet, which is a “zombie army” of computers used to deliver additional attacks on other potential victims. And it all happens because of a little piece of code that scans your system for outdates software. Did you know that marketing & attractive pricing can make an exploit kit more appealing? Here’s an example you may want to read about: at the beginning of this year, our team noticed a substantial increase in exploit kit activity for Neutrino, RIG and Angler, which mutated and included new techniques to evade detection by traditional antivirus solutions. 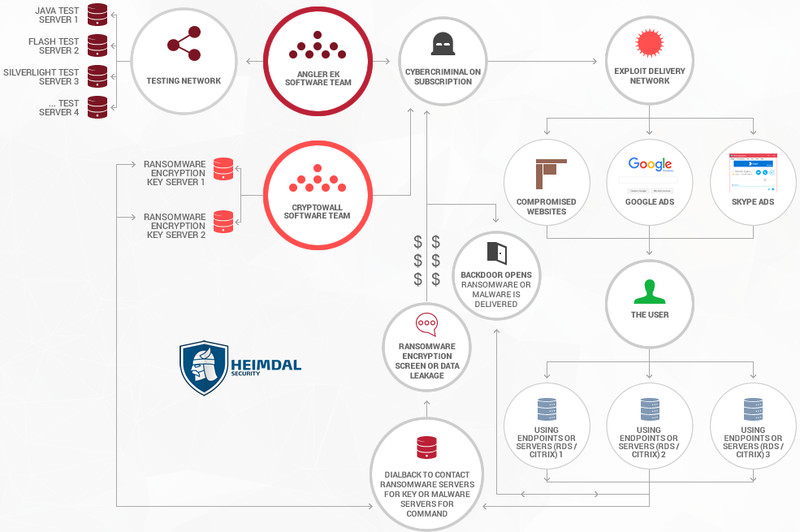 Our team at Heimdal Security has observed a very recent change in the servers that are abused by the Neutrino exploit kit. Among other malware, Neutrino now spreads ransomware from the Kovter class and ransomware from the Cryptolocker2 family. This new campaign also comes with added surreptitious tricks: Google Blackhat SEO poisoning and an immediate focus on using Flash Player vulnerabilities as a distribution vector. Is as up to date as possible – exploit kit creators keep their “products” up to date by integrating new vulnerabilities as soon as they’re discovered; the more recent a software vulnerability is, the better it can be exploited to make the infection successful. 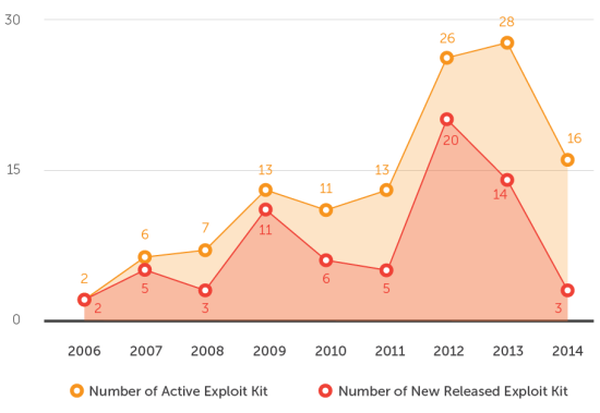 For the last two years, exploit kits have been known to include almost entirely new and up-to-date exploits. Exploit kits are still sold in their entirety (including source code), but they still have exorbitant prices ($20-30k). For this reason, users rent them for the limited periods ($500/month). To get an idea of how much damage an exploit kit can do, let’s take a peek at these numbers provided by an in-depth analysis conducted by Talos. 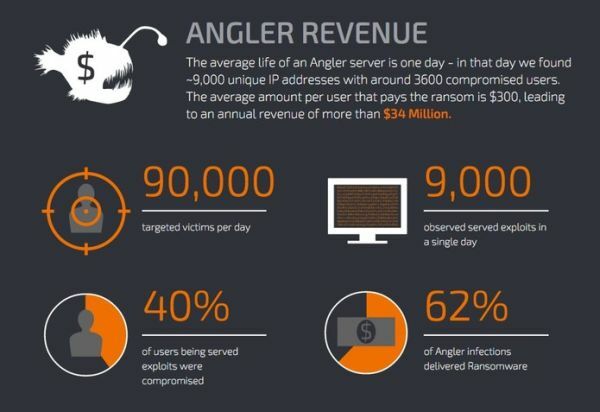 The numbers show how much money Angler can make its creators and their clients when driving ransomware infections. And while exploit kits-as-service generate hefty profits for cyber attackers, it also creates enormous expenses for the business world and for regular Internet users. Malicious code injection – websites can be compromised by infecting them with malicious code, which can drop exploit kits and malware onto the victim’s system only via a simple website visit. Our team has recently monitored and analysed a new stack of drive-by campaigns which aim to spread the Angler exploit kit by injecting malicious code into compromised web pages. Because of the mechanisms involved and the attackers’ objectives, the campaign is prone to achieve large distribution and affect a big number of PCs and their users. And, mind you, these types of events as the ones described above are going on all the time. The infrastructure hosts these automated triggers and infection processes that are perpetuated by cyber criminals of all backgrounds and incomes. “Fileless” infections – this may not be an entirely new feature, but it was certainly used heavily in malware campaigns; the exploit kit drops a payload (the bit of code that executes malware) into the memory, so no files are actually downloaded onto the system, making it impossible for traditional antivirus to spot the infection (because antivirus scans for infected files). These three features, coupled with polymorphism and the fast integration of new vulnerabilities make exploit kits something to worry about. Office productivity software: Microsoft Office, Adobe Reader and more. Why are Java’s Vulnerabilities One of the Biggest Security Holes on Your Computer? What can I do to keep exploit kits from raiding my system and infecting it? Keep your software updated at all times. If everyone installed all the updates, we’d all enjoy a much safer web. Updates don’t only bring in new features, but they also include much-needed security patches which makes your PC safer against cyber attacks. And that includes operating system updates, of course. And if you truly hate update prompts (and, honestly, who doesn’t? ), then just install Heimdal FREE to handle your updates for you. Automatically, silently, without ever having to worry about another update again. What to do about the vulnerabilities that even software makers don’t know about (Zero Days)? For that, you’ll need a reliable antivirus product and another solution that can catch infections that antivirus can’t. Yes, even though antivirus can’t catch exploit kits (the most advanced, at least), you still need it. Don’t ditch it just yet. More protection layers mean there are less chances that a malware infection targeting your system can be successful. While tech terms can make you shy away from concepts like exploit kits-as-a-service, don’t. There’s always a way to explain things in a way that they can benefit your knowledge. I hope this article did just that. If you should have any questions, I’d love to answer them, so please leave them in the comments below.